This is my picture for today. 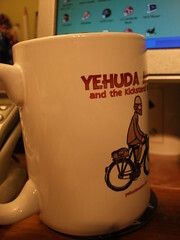 It's my Yehuda Moon mug. Why am I posting this? Well, today I signed up for the Thames Bridges cycle ride in May. This ride is in aid of the stroke association. They've already had some cash from me for my entry fee - but I'd like to raise some more - your help would be welcome. As a practical matter, I'll be cycling roughly double the distance of the event - as I plan to cycling home from the finish.